be quiet! as the name implies, is a company focused on silence. Whether it be power supplies, case fans, or CPU coolers, this group of German engineers is obsessive about providing the maximum possible performance while maintaining absolutely silent running. 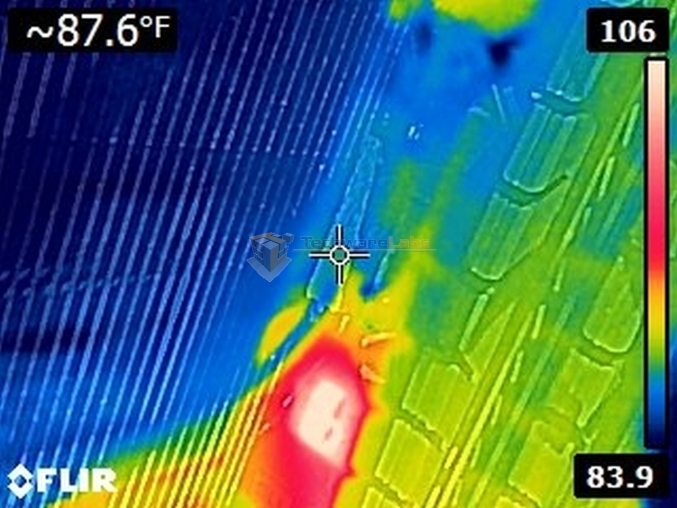 They’re so confident in their performance, in fact, that they set us up with a FLIR E6 thermographic camera so that we could see first-hand how well their products perform. 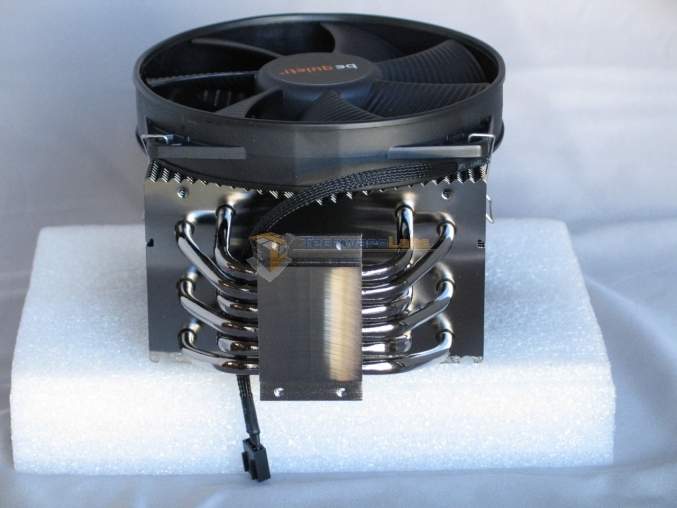 Today we’re going to be taking a look at their flagship CPU cooler, the Dark Rock 2. 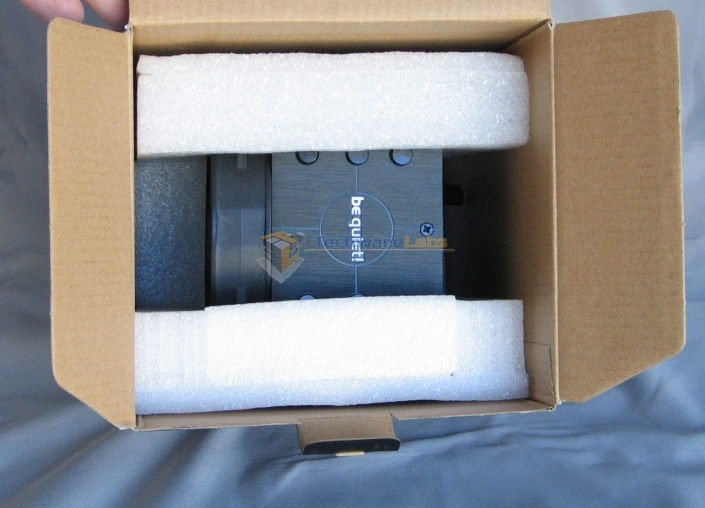 The box provides us with a nice profile shot of the cooler, as well as some pertinent claims: works with LGA 2011 socketed motherboards, designed for <=180TDP CPUs, and a claimed maximum noise level of 21.2 dBA. …all of the little fiddly bits that are needful to make a CPU cooler compatible with the slew of various CPU sockets out there. 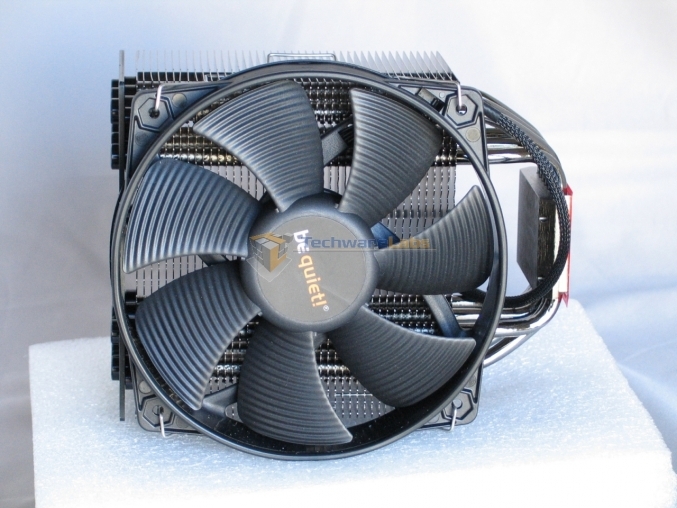 This cooler can handle every mainstream Intel socket from LGA 775 on up, including LGA 2011. On the AMD side, it can handle everything from AM2+ forward. Aside from the various brackets, the accessory box includes screws, spacers, and a small tube of thermal grease. Taking a look at the cooler itself, one thing that becomes immediately apparent is how low-slung the fan is. If you’re using a LGA 1156/1155/1150 CPU, as many are nowadays, you might have issues with clearance between the RAM and the fan housing. Thankfully, the bracket design allows the cooler to be mounted in any of four facing directions, which allows for the fan to be mounted “backwards” so that it’s pulling air through from the back, rather than pushing it in from the front. The fins are tightly, evenly spaced, with no bent or misaligned parts. Coupling between the fan latches and the heatsink is very tight; I had to experiment a bit before I found out how to get the latches to unlock to flip the fan, and once back in place it felt like the fan housing was welded to the body of the heatsink. 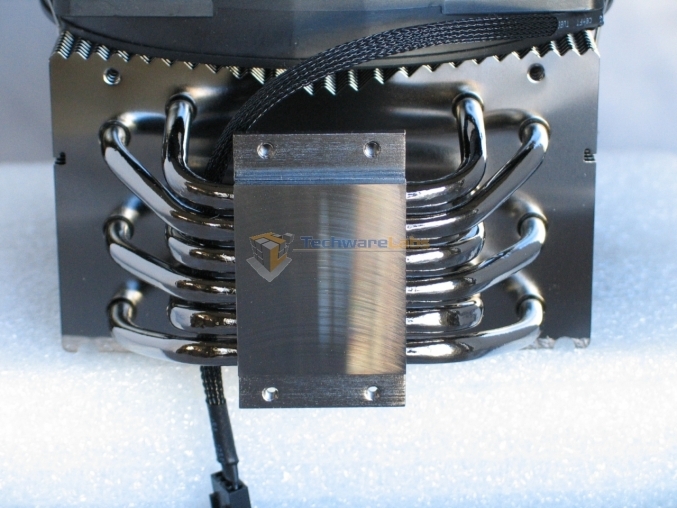 The CPU block is mated to six U-shaped heatpipes, which should provide excellent thermal conductivity. The braided wrapping around the fan wires is a nice touch; nothing ruins the look of a build more than bright red and yellow power wires in prominent locations. Zooming in on the CPU block, we can see that while the surface is smooth, be quiet! hasn’t bothered lapping it to a mirror shine. This is fine by me; a mirror finish doesn’t appreciably improve the conductivity; if it did we wouldn’t be bothering with thermal grease. Normally, this section of the review would be pretty dull; graphs showing Δ°C and such. Thanks to the fine folks at be quiet!, though, we get to show you something a little more interesting this time around. 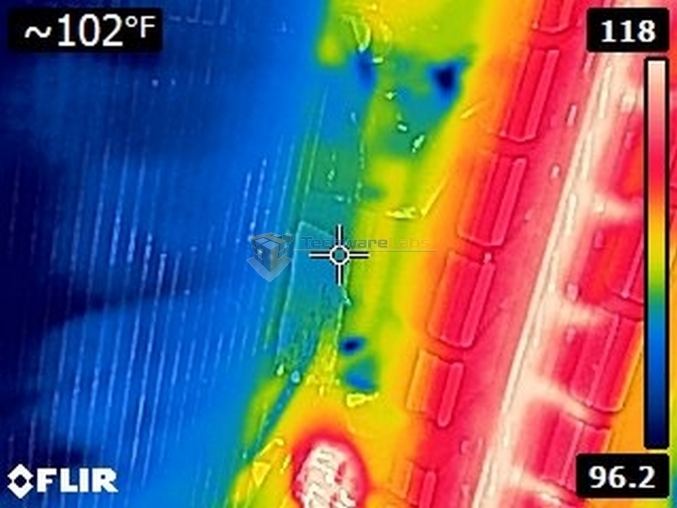 We have thermographic images of the Dark Rock 2 in action, courtesy of the FLIR E6 thermographic camera. 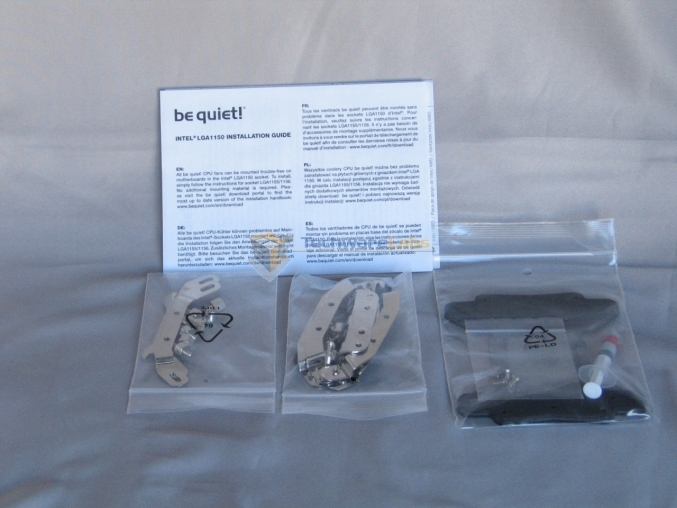 Many thanks to be quiet! for donating this equipment; this review just wouldn’t be the same without them. First, an image of the CPU cooler area when the system has been powered off for ~45 minutes. Ambient temperature in the room was ~82°F/28°C, which is about where the inside of the case was. 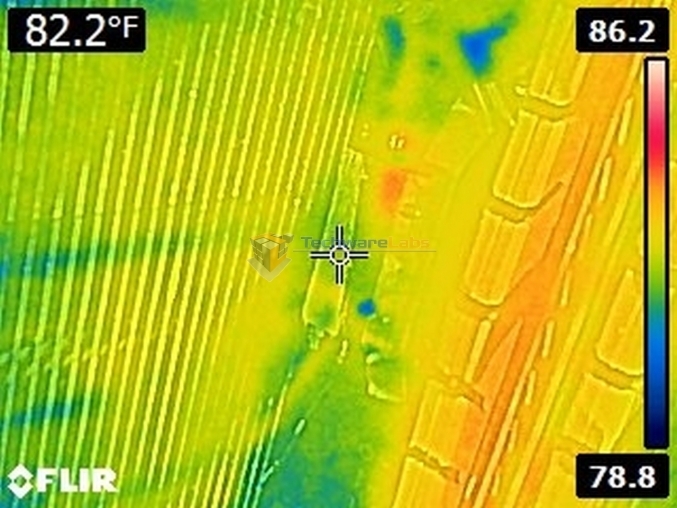 Since the FLIR calibrates its colors based on the total range of temperatures observed, this paints the whole area in yellows and greens. Next up is the system at idle. Recorded on-die temperature was 104°F/40°C. Note that our target temperature, measured at the crosshairs in the center and displayed in the upper left, was 87.6°F/30.89°C. This means that while the CPU was 12°C above ambient, the Dark Rock 2 was pumping heat away so quickly that it registered at barely above ambient! By comparison, that little red-white spot in the lower middle is one of the smaller power rectifier chips surrounding the CPU socket, and it’s reading somewhere in the neighborhood of 106°F/41°C. With Prime95 thrashing the CPU and RAM, things heated up a bit…but not nearly as much as you’d expect. The on-die temperature was 136°F/58°C, but the CPU block never got above 102°F/39°C! Now with this kind of extreme performance, you’d normally expect some great howler of a fan pushing air over it. Not so with the Dark Rock 2; even at full blast the fan was literally inaudible over the still rather quiet whirring of my case fans. I had to double check to make sure my system was actually running, it was so quiet! It’s been a while since I’ve been this impressed by a CPU cooler; everything from the fit and finish to the performance was top-notch. Unlike many coolers that claim to be “quiet” or “silent”, this one actually lives up to its claim. I’d have to take this sucker into an anechoic chamber to even have a hope of hearing it. 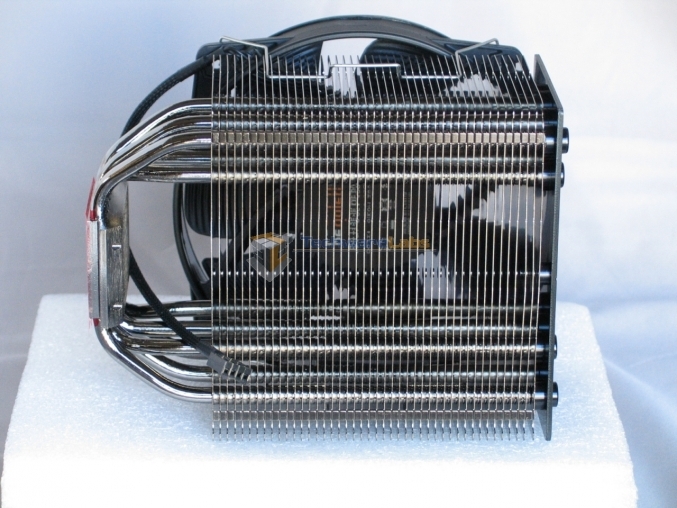 Anyone looking for a replacement CPU cooler for their system is going to be swamped with options. There are a slew of coolers from dozens of manufacturers, all of them claiming to be more powerful and quieter than the last. 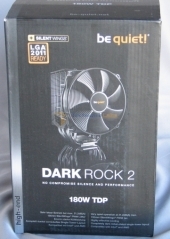 With the Dark Rock 2 from be quiet!, though, we have a winner. I literally could not find a single fault with this cooler, much as I tried. If you want top-notch cooling performance without dealing with all the hassle and potential problems of a liquid cooling system, this is the one to beat. I can’t think of a better candidate for our Editor’s Choice award.